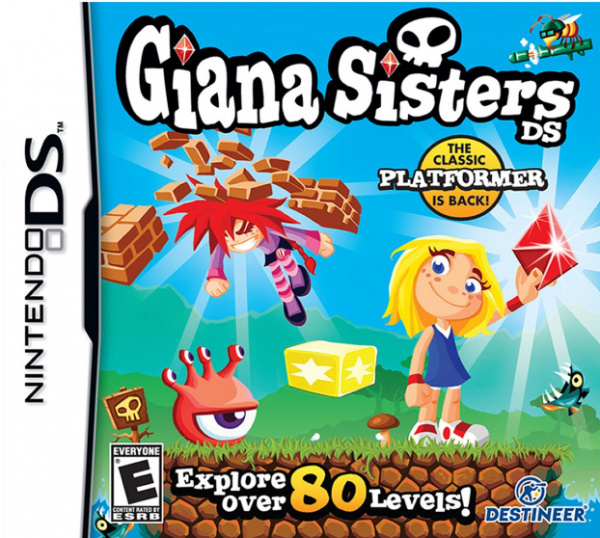 Giana Sisters DS began life as a limited personal computer release called The Great Giana Sisters back in 1987. Due to the game's extremely close resemblances to Nintendo's NES release Super Mario Bros., the game was yanked from store shelves soon after its release, making it quite a rare find today. Now DTP Interactive and Spellbound Entertainment have created a brand new version of the game for Nintendo's DS system that features all of the classic platforming action of the original with a few new twists. Sadly, the game has only seen a very limited release in Europe making this DS version almost as difficult to track down as its personal computer counterpart. It won't take you long to see the resemblances the game shares with the Super Mario Bros. releases, but the developers have done a nice job of adding in some new twists and changing some things up a bit for this DS update. Your ultimate goal is still to reach the flag at the end of each level, but this time around there's a bit more to it. While merely completing the level will earn you a blue flag, the game also presents you with a challenge of locating a number of red jewels in each level in order to score a "perfect" and earn yourself a red flag for that particular level. If you're able to earn a red flag on every level in a particular world, you'll unlock a secret bonus level that can be played before moving on to the next world. This offers a great deal of incentive to go back and locate all of these red jewels as it will ultimately unlock all 32 of the game's original levels from the PC release, among other things. The game even features a set of achievements that you can win by meeting certain criteria, such as beating the game without using a continue or defeating a set number of enemies. Along the way you'll encounter everything from crumbling ledges to burning fires that must be carefully navigated, and of course there are also a host of enemies standing in your way that you can either jump on top of or shoot with a fireball using a Punk Giana power-up. 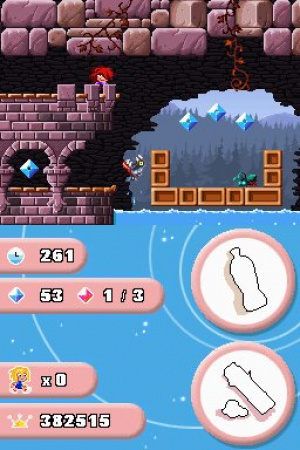 There's even two useful items that come into play in the form of Soda Pop and Bubblegum: Soda Pop will allow you to destroy large chunks of blocks that stand in your way and Bubblegum will allow you to float through the air, each offering a nice gameplay twist to mix things up a bit. At the end of each world you'll face off with a boss in order to move on to the next world. The boss you fight is always basically the same, just featuring a gradually increasing set of attacks and movement speed that make the fights increase in difficulty as you progress from world to world. The patterns are fairly easy to figure out, but it's a nice break up in the usual platforming levels and does offer up a solid challenge in the later levels. 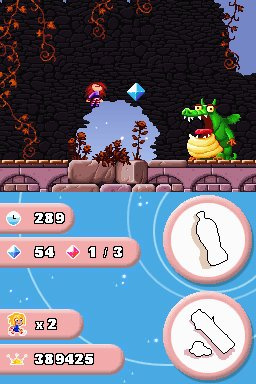 The game features some absolutely brilliant level designs, each with a number of tricky sections and some very well-hidden red jewels to try to find. Thankfully the controls are spot-on and offer up the type of precision needed for navigating the tricky platforming sections strung throughout each level. Even the Soda Pop and Bubblegum gameplay mechanics are extremely well executed and never feel tacked on or forced in any way. Other than being a bit too easy at times, especially early on, it's difficult to find much to complain about with this extremely playable platforming title. The developers have done a great job of updating the visuals of the game while still maintaining the classic charm of the original release. This time around the team's made good use of the DS system's graphical capabilities and painted a watercolour-style backdrop complete with multiple layers of scrolling for added depth and realism. Even the areas themselves show a nice degree of vibrancy and detail, complete with a host of well-animated enemies to round out the package. Toss in a variety of level themes, not to mention a few weather variances, and you've got a solid 2D visual presentation that just oozes charm. The musical score of the original release is still heralded to this day as one of the better audio experiences to come out of the 80's personal computer days, and thankfully much of that personality is still intact with these updated musical tracks. You'll still hear some of the same classic tunes, albeit with a much more well-rounded sound to them, and a host of new musical pieces that perfectly complement the mood of the level they're featured in. As if this amazing musical score wasn't enough, the developer still managed to find room to squeeze in some quirky sound effects to go along with it. 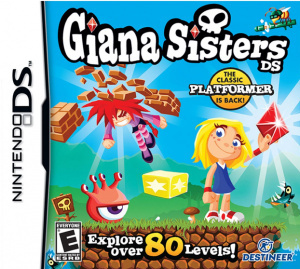 Giana Sisters DS might not have an original bone in its body, but what it does have is over 80 levels of enjoyable and challenging platforming action. The toned down difficulty in earlier levels might prove to be a bit of a pushover for seasoned fans of the genre, but those willing to stick it with it will be aptly rewarded with some extremely challenging levels later on in the game. Given the game's rarity and fairly heft price tag, it's obviously not going to be worth it for everyone, but for those who just can't seem to get enough platforming goodness, it might be worth the trouble to track this little gem down. It is pretty amazing that a game, which I remember as being controversial in the C64 days during the late '80s, is able to earn quality 9/10 reviews when it gets a brand new version 23 years on. Fair play to good level design and Chris Hülsbeck who did the original score for Great Giana Sisters is a legend (I love the Turrican game's music). Excellent review, Corbie. Surely the new Nintendo (Iwata era) will consider this series a compliment to their Mario series and allow a limited release in NA without prosecution. Unlike the Yamauchi-era Nintendo, who probably threatened to send in the Yakuza, the Russian mob, the Sicilians, et al. when this game originally released in the '80s. Maybe I should import this? This should work on a NA DSi XL, right? Yes, I played it on a US DSi. The release date says 3rd Apr 2009 (UK/EU) !? That was the release date, if I'm not mistaken. @ wolfcoyote: They allowed a European release so why should they make any difference for a US release? The publisher's just not interested in bringing it over. I think it might be worth mentioning that both the DS sequel and the original game were developed in Germany, by the way. I always see this game around, but its never cheap. But if I do find it on special Ill defitiely snap it up! Personal computer? I thought it was a Commodore 64 game originally? I remember kids talking about it, way back. 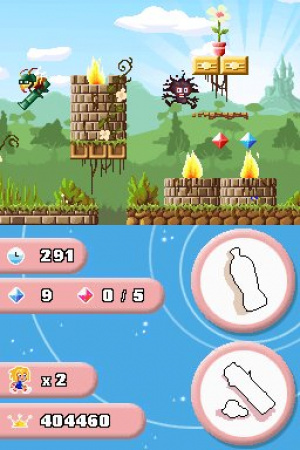 Also, these screenshots don't look all that similar to SMB. Unless all platform games look too much like SMB.. I completely agree with the score, the game is a bit generic, but it's fun as hell. Two $70 sealed copies, TBD. OUCH! I want this game, but not for THAT much! EDIT: So what exactly happened to this? A member of the game's team said it was going to release in America quote "soon," but that was back in Decemeber 2009. As far as I know, there's been no announcement, even though he said they already had a local distribution partner lined up. What the heck? Great, another awesome game that I will have to import. I just purchased a new copy of Maestro! Jump in Music for $46 on eBay. Now I'm going to have to get this game too. I'm not willing to pay $70 for it though. Like everyone else, I'm just going to wait on it. Oh and great review Corbie! @wolfcoyote You aren't too far off there. Shortly after Giana Sisters originally released on the C64, Nintendo complained about copyright infringement and the game quickly got pulled off the shelves. In that case, you really only could get it as a cracked game. Since the new game never saw a DS release in NA, I simply went with the iPod Touch version, and it is one of the best platformers available there (a little on the easy side though). A nice little game for 5 bucks. Is the pterodactyl in it? If you go to the German Amazon site, Amazon.de, you can buy the game for about $35 US. I am thinking about it. @LinktotheFuture: One problem: Amazon won't allow you to import video games through their sites, I've tried. Not sure if Amazon.ca counts. I know there's a lock on digital media from .uk, which I'm sure would extend to .de. Probably has to do with legal junk on their side more than on ours. The game isn't rare here, I see tons of surplus copies for 15€ so I'd guess it was a commercial failure. Kimiko: Yeah, it's C64, maybe Corbie used the catch-all moniker PC to include the Amiga version (my C64 says "Commodore 64 Personal Computer" on it so I'll let that slide). Yeah back in the 80's they were all called personal computers. Rather than mention all of the various computers, I just lumped them all together. This is rare in the UK, I've never seen a copy. @KDR_11k: I'm jealous! Care to help a guy import? Wow i really want this game, awesome review corbie. Corbie, why on Earth did you take so long to tell us about this wonderful gem??? Yeah, I just got this, it's really good! But my copy doesn't have that big ugly USK diamond on the front, and it has the recent style of PEGI rating (with a coloured background). I wonder if the game was reprinted? I may have to get this. I do like me a good platformer. This game must be coming North America soon. I saw in Nintendo Power a review for this game. They also gave the game a 9 or 8/10. This game is also available for iPhone/iPad, for those who are still looking for it. Definitely worth a download. That said, I prefer traditional controls as opposed to the touch screen alternatives, especially for platformers like this, so if they do release a retail DS version in North America, I'll definitely buy it. I haven't seen any info about an NA release--but I also noticed the review in Nintendo Power, so that seems like a hopeful sign. I don't know why we had to wait so long, but better late than never. I heard it was on a limited release, so I just placed an order for it. I may have to hunt this one down. It's on the shelves at my Walmart for $20...I'm really, really tempted by this. Does anyone know if this works on a 2DS/3DS console? I'm not a fan of commenting on older reviews, but man this game is awesome!!!!!!!!!!!! I found it a local record that is closing down, got the US version for new $13!!!!!!!!!!!!!!!!!!!!!!!!!!!!!! Of course I opened it, but US release so Anyway, while it is easy it is very, very fun. Love the art style and the soundtrack. If you find this little sucker for dirt cheap, buy it!!!!!!!!!!!!!!!!!! !